An ESL story lesson about their community can help English language learners become more familiar with their new home, potentially gaining a sense of comfort and belonging in the process. Students can research local events of importance over the years. Making connections with events in U.S. and world history can add interest to other subject areas, making it a great opportunity to collaborate with other teachers. A study of the Vietnam War in history class, for instance, can become more interesting when students interview a local veteran of the war and read newspaper articles about protests of the era. While this is a good learning experience for the students, it can also be a good lesson in diversity for community members as they see familiar events from a new perspective. You can help students learn more about the famous writers, painters, and musicians of the English-speaking world. Start each class with a famous song, poem, or painting, and read simple biographies of famous cultural figures. However, culture doesn't just mean the arts. Popular culture can be just as important to English language learners for engaging in conversation and feeling a sense of belonging. Local culture can also include information on favorite pastimes and hangouts that most residents take for granted. Whether hunting and fishing are big in your area or everyone likes to relax at the beach on the weekends, teaching students about these activities can help them make connections with their neighbors and co-workers. Where do you go shopping for food, clothes, and electronics? Where can you go to get a late-night snack? Create a list of the things "everyone knows" and think of ways to pass along some of this information to your students. English lessons can focus on words and phrases directly related to these tasks. Design an advertisement, website, or brochure describing the benefits of a community resource like the library or a free clinic. Give a speech to the class on what they have learned. Compare a historical event, cultural presentation, or resource to a similar happening in their home country. Create a list of 10 vocabulary words related to a particular event or service. Visit a local business and speak with an employee. Write a business letter asking for more information. Write a letter to the editor of a local newspaper encouraging more people to use a community resource or visit a cultural event. Create a timeline of historical events in your town. Draw a map highlighting local points of interest. Using video or photographs, lead classmates on a virtual tour of the area. Write a book about your city, with each student contributing a page. The library can also be a good source of information and texts for students, such as back issues of newspapers and other historical documents of local interest. If you are asking students to visit local sites on their own time, be aware of potential transportation issues or conflicts with work and family schedules. Instead, plan a field trip for the entire class, or bring the sites to your students by inviting guests into the classroom. "ESL Learn About My Community Story." YourDictionary, n.d. Web. 22 April 2019. 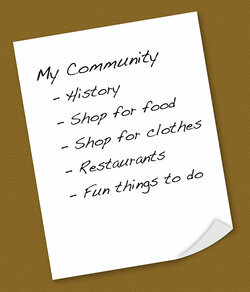 <https://esl.yourdictionary.com/lesson-plans/ESL-Learn-About-My-Community-Story.html>.